We tested several aero helmets. Not surprisingly, we found that every athlete responds differently to aero equipment. One common theme is that there were “good” and “bad” helmets, regardless of the rider that was testing them. 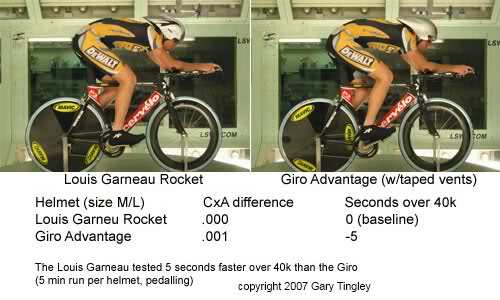 Results for the Louis Garneau and Giro are shown above. Surprisingly, the old Troxel titanium dimpled helmet also tested well. We also tested three hand positions, the “pointer”, “pistol”, and “superman”. What was apparent is that there were little discernible differences in the results, with the best result from the original baseline “pointer” position. This is likely due to the smaller frontal area that the position provides, as compared to the other two positions.